This series' version of Professor Utonium. His real name is unknown, aside from his family name Kitazawa. In this incarnation, he has a son named Ken, who is responsible for all those affected by the Chemical Z lights, especially the Powerpuff Girls Z. Professor Utonium was originally experimenting with the substance Chemical X and strove to find a way to change its chemical properties. Professor Utonium has created several inventions throughout the series; the most important one being his Chemical Z Particle Ray, which allows him to transform those affected by the lights back to normal (although it doesn't prevent recurring transformations nor is it able to work on all black light victims). He seems to be aware of the effect Ken's lack of a mother has had on his son, assuming that it had caused him to be a bully to the girls. However, this does not change his behavior towards Ken. 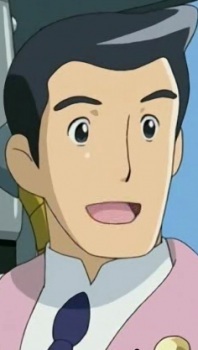 He appears to be a gentle father figure like the original Professor Utonium was in The Powerpuff Girls. He treats the girls like members of his family and is very close to the Mayor and Miss Bellum. While he is very gentle and serious, Professor Utonium may, at times, act a little less mature than he usually does.